Races & Events | Keep It Up, David! This page serves as my official record of completed races. Click on event names to read my recap and see photos. They’re listed from most recent to oldest. 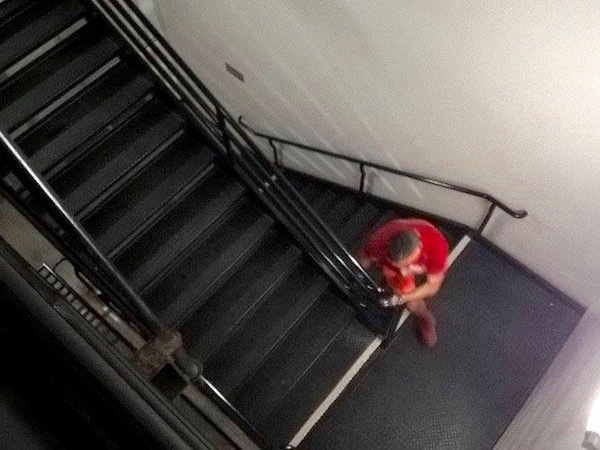 Most of these are stair races – events where I race up the stairwells in skyscrapers. Want to try one? Click here for Stair Training 101. December 2018: Hike the Halo. This race, up and down the aisles of Angel Stadium, had a longer course this year, and I finished it with an Official Time of 29:51. December 2018: 65 Roses Climb. A new name for the race up and down the aisles at the legendary Rose Bowl. I finished in 24:02 (Official Time) and have video of me crossing the finish line! October 2018: Tram Road Challenge. An all-uphill 6k, heading into the mountains in Palm Springs. My third time racing, and it doesn’t get any easier! Official Time: 59:17. October 2018: Runyon Up. The inaugural climb in Salesforce Tower, the brand-new tallest building in San Francisco. I finished 61 stories in 16:53 (Official Time)! 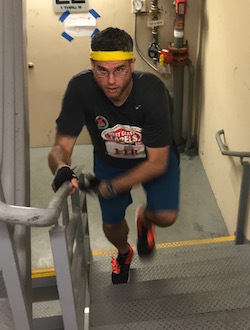 September 2018: Stair Climb for Los Angeles. I didn’t have expectations, as this 75-story race was just weeks after I was allowed to exercise after a surgery, but I did much better than I thought I would! Official Time: 20:10. August 2018: Conquer the Overlook. I had to walk this hill- and stair-filled 5K, instead of running it, for medical reasons. But it was still fun to be there! My Official Time was 54:41. June 2018: Tower 2 Tower. Two buildings, and an obstacle course in between, which was harder than the last two times I did it. My time was my slowest ever, thanks to that brutal obstacle course! Official Time: 18:55. May 2018: The Lemon Climb Denver. My first time doing this race, up a 43-story building. I finished in 9:08 (official time) and was really geeked. My sister raced too! April 2018: San Francisco Fight For Air Climb. The largest family turn-out yet: me, my sister-in-law, and 2 nephews! And I squeaked out a 2-second PR in the 48-story stairwell. Official Time: 8:49. April 2018: Los Angeles Fight For Air Climb. My seventh year competing. 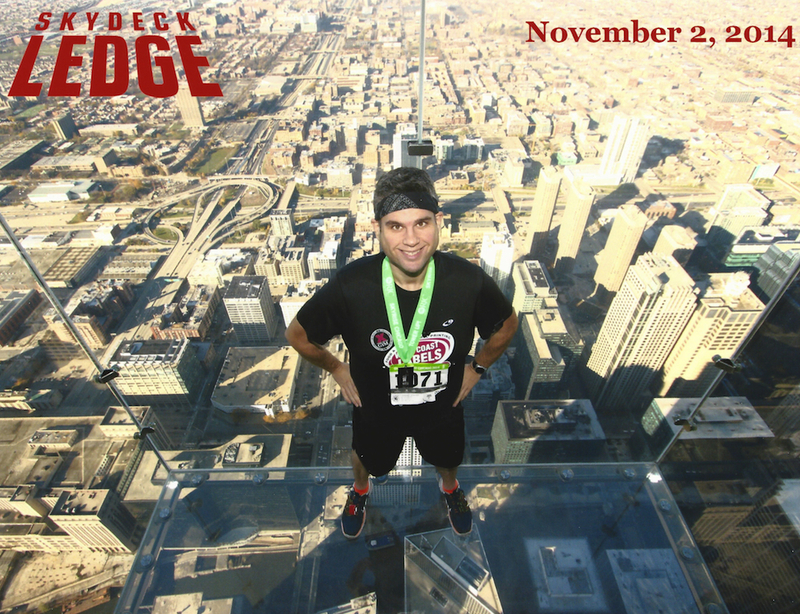 It was a tough race and not my best day, but still made it to the roof of a 63-story building in 14:48 (Official Time). April 2018: Derby Day 5K. A fun race at Santa Anita Park – the last quarter mile was on a horse racetrack! I crushed my 5K PR by over a minute and a half. Official Time: 29:15. March 2018: Eiffel Tower Vertical. My first international race, and up the most famous landmark on Earth! 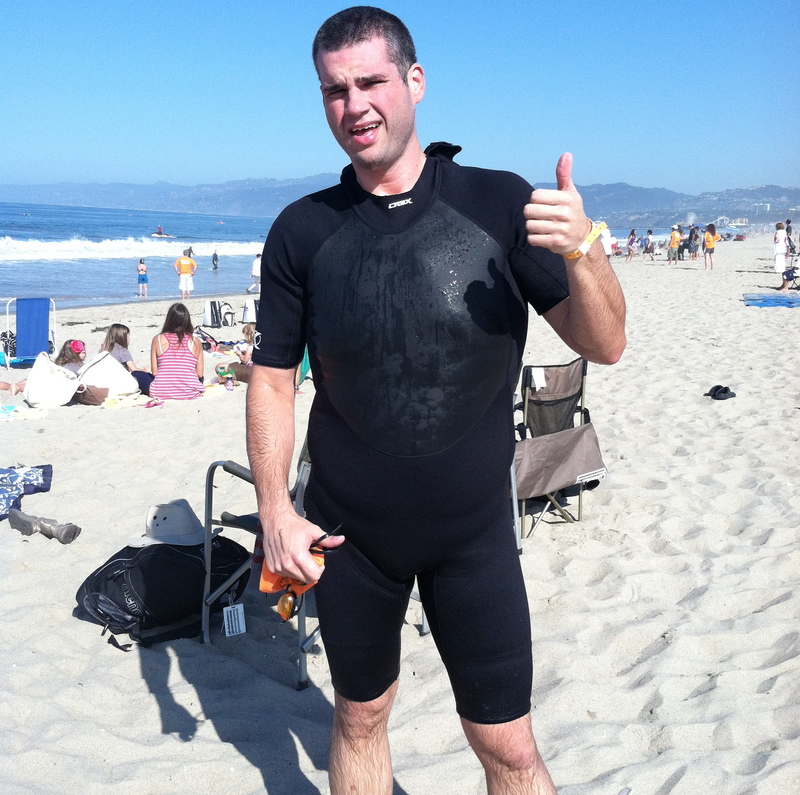 I was only one of three Americans selected for this race. Official Time: 16:17. March 2018: Tustin Hangar 5K. The route included running through an enormous, historic blimp hangar from World War II. Awesome! Official Time: 30:48. February 2018: Scale the Strat. My third time racing up the Stratosphere Tower in Las Vegas. Didn’t set a PR, but was only 19 seconds off. Official Time: 13:02. January 2018: Dallas Vert Mile. The longest race of my life! 12 times up the 50-story Reunion Tower. That’s 600 total stories! Official Time: 2:03:38. December 2017: Del Dios Trail 10K. After two stair races scheduled for the same day were cancelled, I found a Plan C: my first 10K trail race! Official Time: 1:04.52. December 2017: Los Angeles CF Climb. My first time racing the aisles at the world-famous Rose Bowl. I was feeling a little under the weather but still finished in 23:42 (Official Time). November 2017: Milwaukee CF Climb. My first time racing in Milwaukee, and it was up the 47-story US Bank Center. Finished in 9:14 (Official Time) and then climbed twice more for fun! November 2017: SkyRise Chicago. A triumphant return to the tallest stairwell on this half of the planet. This year’s race was two stories taller (105) and I still had a 2:31 PR! Official Time: 25:18. September 2017: Stair Climb for Los Angeles. My fifth year racing up 75 stories in the US Bank Tower. Didn’t think I’d get a PR, but I ended up pretty damn close – only 4 seconds off! Official Time: 18:34. September 2017: Conquer the Bridge. What a race! Over a huge suspension bridge… and back. I finished the 5.3-mile course in 55:42 (Official Time). August 2017: Conquer the Overlook. My 3rd year running this super-hilly 5K that ends with a huge hillside stairway. My Official Time was 39:14 – about 30 seconds slower than my PR, but over a minute faster than last year! June 2017: LA Pride Run 10K. I did this race last year, but only the 5K. This year, I did the 10K, and finished in 1:02:48 (Official Time). June 2017: Tower 2 Tower. Two buildings, and an obstacle course in between. I set a new PR (by 44 seconds) and crossed the finish line in 12:50 (official time). April 2017: San Francisco Fight For Air Climb. I’ve climbed in San Francisco before, but this year’s race was in a brand-new building. I climbed 47 stories in 101 California in 8:51 (official time)! April 2017: Los Angeles Fight For Air Climb. I never wanted to PR so badly as I did at this race, where I was celebrating my five-year anniversary in the sport of stair racing. 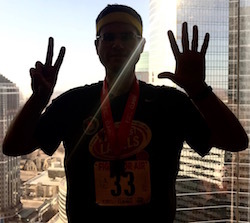 My sixth time racing the 63-story Aon Center, and I did it faster than ever! Official Time: 14:30. April 2017: Coaster Run. Why not throw a 10K into the mix in the middle of stair race season? This one was around and under the roller coasters at Six Flags Magic Mountain, and I finished in 1:03:40 (official time). March 2017: Seattle Big Climb. I finally raced up the tallest building in Seattle – the 69-story Columbia Center! And I made it to the top in 13:37 (official time). March 2017: Climb Wyndham (Springfield Fight For Air Climb). A power hour, where I climbed a 30-story hotel in Springfield, Illinois as many times as possible in 60 minutes. I completed 8 climbs! February 2017: Hustle Up The Hancock. My first time racing up the iconic John Hancock Center in Chicago. Made it to the 94th floor in 19:22 (official time)! February 2017: Minneapolis Fight For Air Climb. 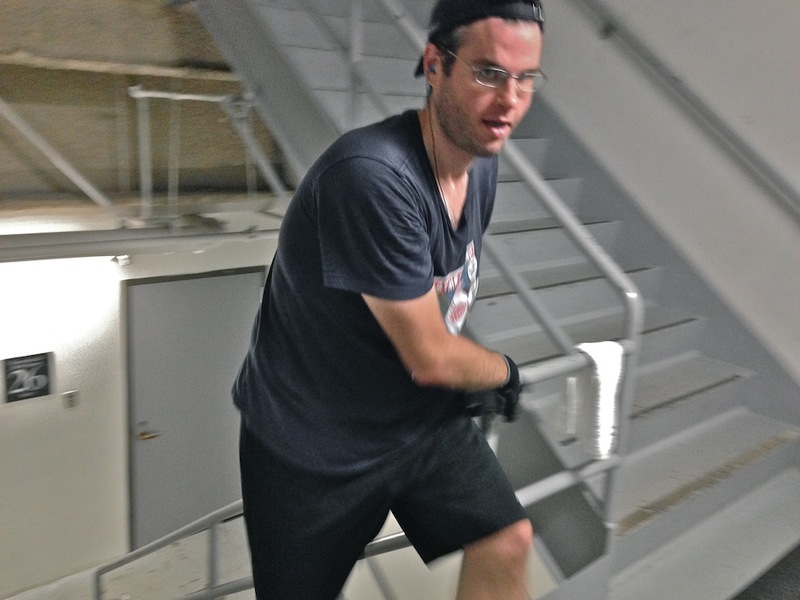 A power hour, where I climbed 31 stories in the US Bank Plaza as many times as possible in 60 minutes. I completed 7 climbs! December 2016: Los Angeles CF Climb. Held in the LA Memorial Coliseum… home to the Olympic games TWICE! The course was up and down countless aisles – around 3,500 steps total, and I finished in 30:25 (official time). December 2016: Hike the Halo. My third consecutive PR at this race! 2,000 steps + 2 miles of running = a challenging course at Angel Stadium. Official Time: 26:47. 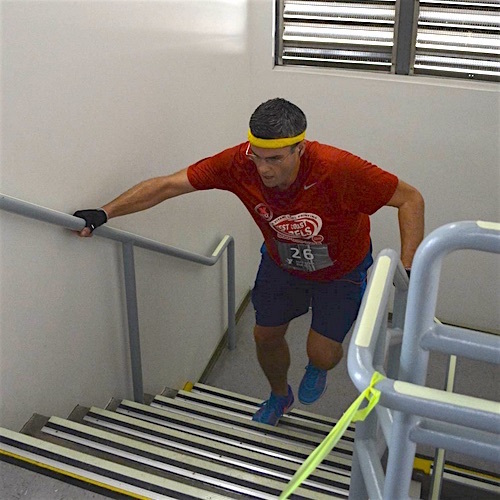 September 2016: Stair Climb for Los Angeles. My fourth climb up the tallest stairwell in the west. I was healing from a foot injury, yet still managed my second-fastest time (19:36!)! August 2016: Conquer the Overlook. My second time doing a brutally challenging, super hilly 5K that includes 282 steps! My Official Time was 40:43. I also did a sprint up the stairs in 4:01. July 2016: Escape to Belle Isle 10K. My first 10K in 4 years! A beautiful course around the perimeter of an island in the Detroit River. Official Time: 59:40. June 2016: San Diego TOWERthon. My second time competing in the most grueling stair race I’ve done: 2 hours of continuous climbing. I completed 16 climbs up a 20-story building AND did a one-time sprint in 3:11. June 2016: LA Pride Run 5K. 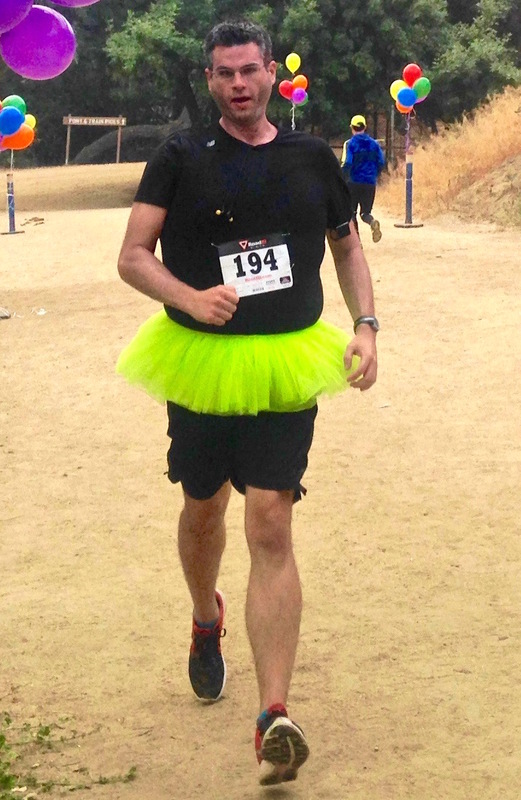 I ran a 5K in Griffith Park while wearing a tutu to honor my friend Richard Simmons. Official Time: 31:29. June 2016: Tower 2 Tower. 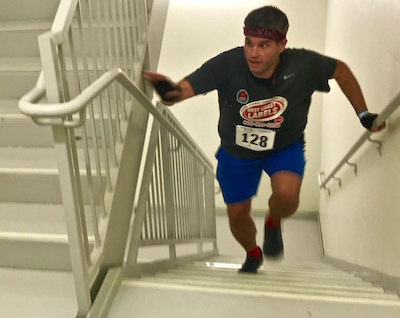 The first stair race I’ve done that included two buildings (36 stories total), a downstairs portion, and an obstacle course in the middle. Official Time: 13:34. May 2016: XTERRA Malibu Creek 6K. My first mountain trail race! Truly a special and unique experience. Official Time: 43:57. April 2016: Los Angeles Fight For Air Climb. The worst race of my career… at one point I didn’t think I’d finish! But I did, crossing the finish line 63 stories up, with an Official Time of 15:38. March 2016: San Francisco Fight For Air Climb. A triumphant return to 555 California, where I finished in 11:53 – a PR by nearly 2.5 minutes! February 2016: Scale the Strat 2016. It’s been two years since I raced up the tallest observation tower in the US, and I set a 2:37 minute PR! Official Time: 12:43. February 2016: Denver Fight For Air Climb. My first time racing up stairs in a high-altitude city, up the tallest building in Colorado. I climbed a 56-story building 4 times in one hour! January 2016: Portland Fight For Air Climb. Nailed a 20-second PR while climbing 40 stories four times in the US Bancorp Tower! Official Time: 35:30. January 2016: Seattle Fight For Air Climb. Climbed 160 stories (4 x 40-stories) in 31:36 (Official Time) – that’s a PR of 3:37! The largest PR thus far in my stair-racing career. December 2015: Hike the Halo. Shattered my PR by over 2 minutes in this race up and down the aisles at Angel Stadium. The third time’s a charm! Official Time: 27:21. November 2015: Los Angeles CF Climb. My third year climbing 54 stories to the roof! Didn’t set a PR, but was 2 seconds faster than last year! Official Time 12:27. October 2015: Tram Road Challenge. A 3.7 mile run in Palm Springs, uphill – with a 2,000 foot elevation change! It was grueling, but in gorgeous surroundings. Official Time: 1:00:46. October 2015: Base 2 Space. 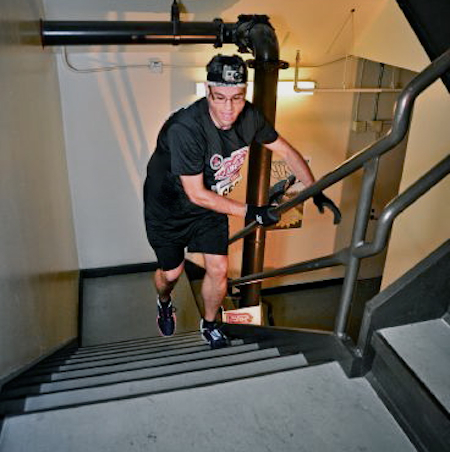 The inaugural stair climb race in the iconic Space Needle in Seattle! Made it to the 52nd floor in 9:19 (Official Time)! 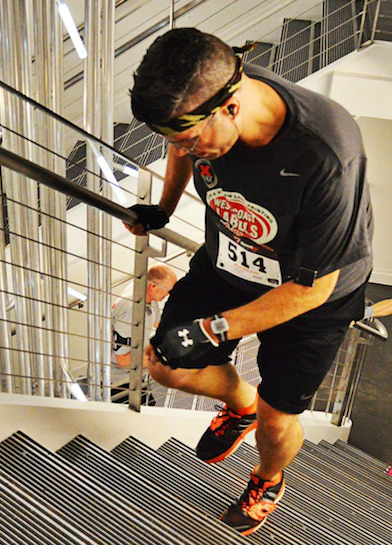 September 2015: Stair Climb for Los Angeles. It was my third time racing up the tallest building on the west coast, and it just wasn’t my day. I had my slowest time ever (Official Time: 20:35), but I managed to turn my day around by climbing the building two more times – for fun. August 2015: Conquer the Overlook. A very challenging, hilly 5K that ended with a 282-step stair climb up the side of a huge hill. A very unique race that I finished in 38:42 (Official Time). 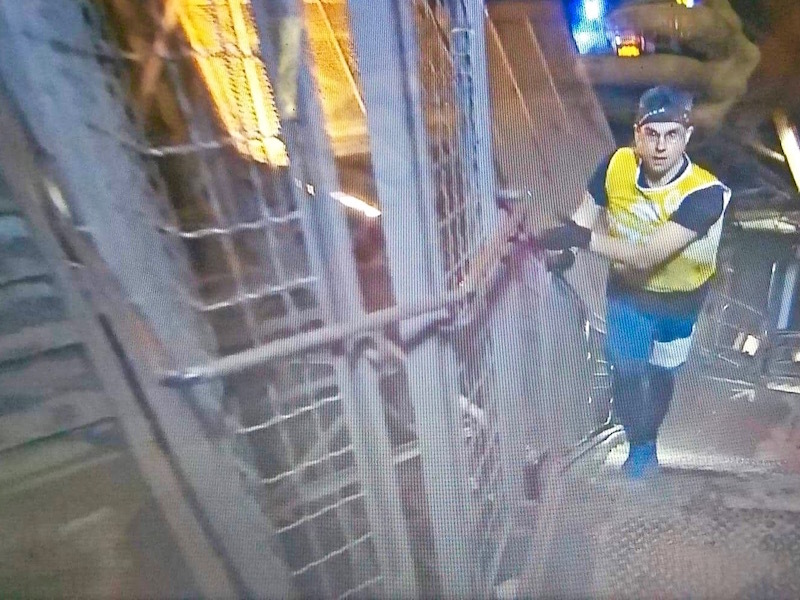 May 2015: Tunnel to Towers Tower Climb, New York City. What a powerful, profound day. I competed in the inaugural stair race in the new One World Trade Center buidling, just feet from where the twin towers stood. Made it 90 stories in 25:01 (Official Time), and honored to participate in such a meaningful event. May 2015: Heroes Memorial Climb, Dallas. Never been to Dallas before, and on my first visit, I raced up the 57-story Reunion Tower…twice! Official Time: 19:53. April 2015: Los Angeles Fight For Air Climb 2015. This is my fourth time racing in the 63-story Aon Center. This was where I did my very first race three years ago, and this race marked my 20th stair race! Official Time: 16:29. March 2015: San Francisco Fight For Air Climb 2015. 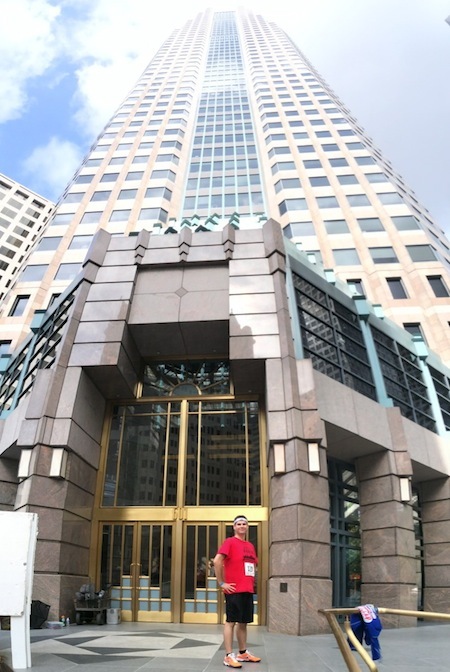 I raced up the 53-story 555 California building, and made it up in 14:20 (Official Time), after being sick for a few days. Great views from the top! 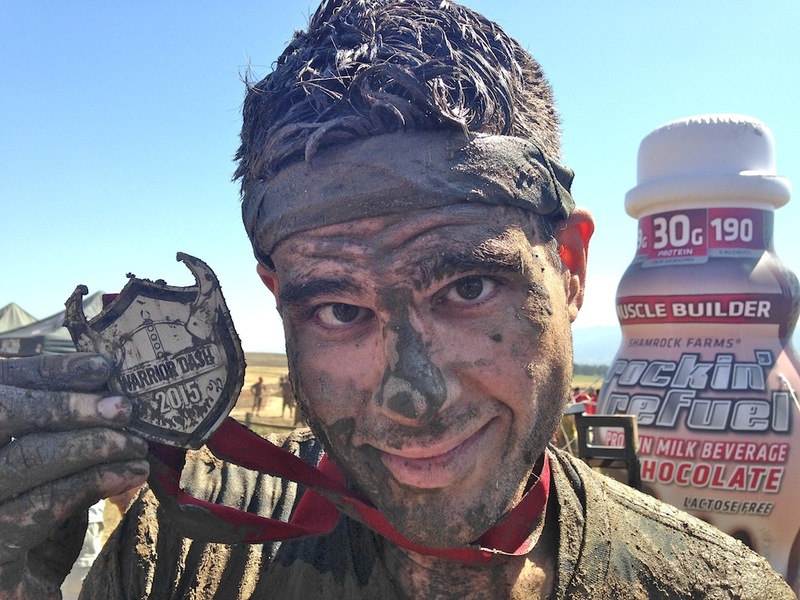 March 2015: Warrior Dash. My first time doing a 5k race filled with muddy obstacles, and it was a blast. It wasn’t timed, but you should definitely click the link, because there are some incredibly fun, mud-filled photos! March 2015: Phoenix Fight For Air Climb 2015. My first time in Phoenix, and while there, I climbed two towers twice, for a total of 106 stories! Made it to the finish line in 24:16 (official time)! March 2015: Detroit Fight For Air Climb 2015. My home state race! I got to the top of the 70-story Renaissance Center in 11:28 (Official Time), and battled some annoying obstacles along the way. January 2015: Portland Fight For Air Climb 2015. I raced 4 times up the 40-story US Bancorp Tower. That’s 160 stories, and just one day after doing the same thing in Seattle (see below)! Official Time: 35:50. January 2015: Seattle Fight For Air Climb 2015. My first race of 2015! Four times up the 40-story Rainier Tower. I completed 160 stories in an Official Time of 35:13! December 2014: Hike the Halo 2014. 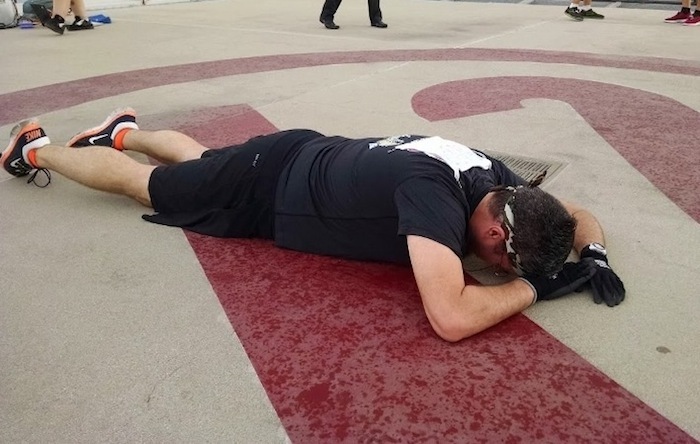 This race, at Angel Stadium, combines running with 2,000 stairs. I set a personal best, and finished 20th overall and 9th among all men! Official Time: 29:31. November 2014: Los Angeles CF Climb. My second year racing up the 54-story Figueroa at Wilshire building. I didn’t beat last year’s time, but I gave it my all and finished in 12:29! November 2014: Chicago CF Climb. A 58-story race in 300 N. LaSalle, right on the Chicago River. I came in 42nd among all men, with an official time of 13:44! November 2014: SkyRise Chicago. 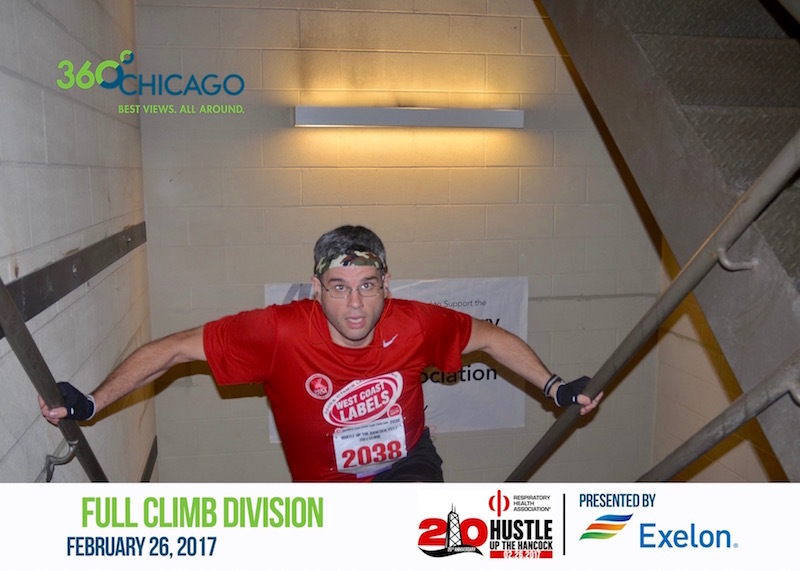 The tallest stair climb race in the country, at the iconic Willis (Sears) Tower! There’s 103 stories and 2,115 steps, and I finished in 27:49! 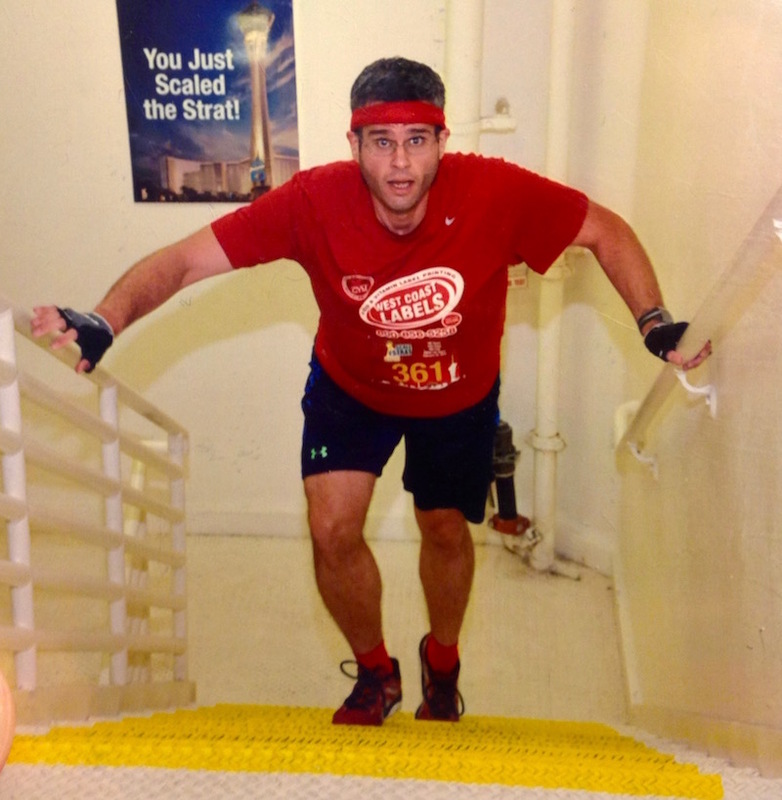 September 2014: Stair Climb For Los Angeles. My second year racing up the tallest building on the west coast. Last year, I climbed 75 stories/1,664 steps in 20:29. This year, my official time was 18:30! May 2014: San Diego TOWERthon. The hardest race I’ve ever done. First, a 20-story sprint (Official Time: 3:01.9). Then, a two-hour race to see who can climb a 20-story building the most times… exhausting! I completed 17 climbs. April 2014: Los Angeles Fight For Air Climb 2014. My 3rd time racing up the 63-story Aon Center. My goal was to set a personal record, and with an Official Time of 15:14, I reached my goal by 10 seconds! BONUS RECAP VIDEO: Click here for an awesome video that brings you along for the climb! March 2014: San Diego Fight For Air Climb 2014. 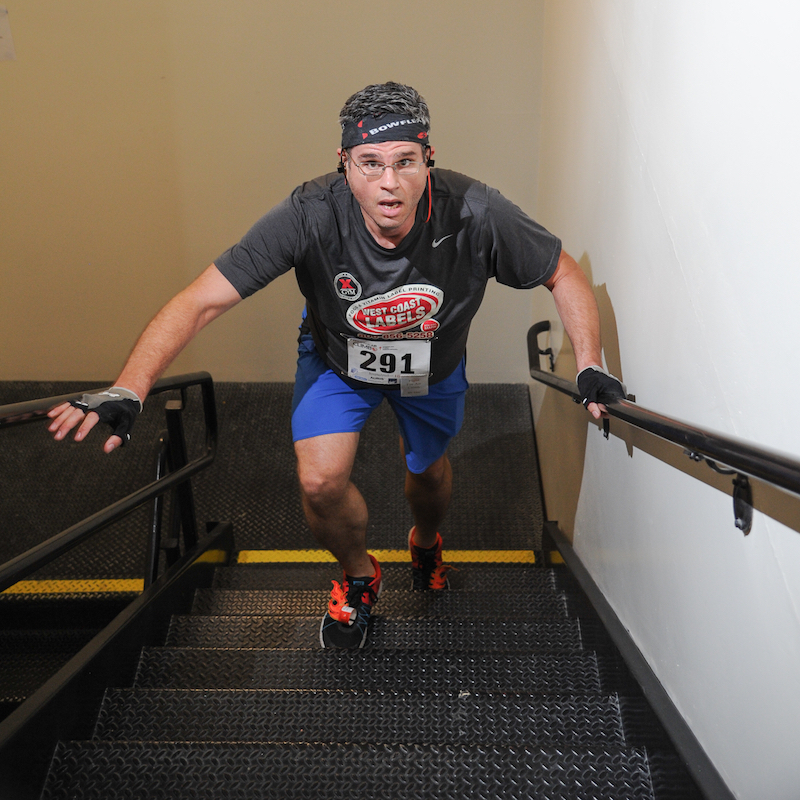 A stair climb race up 32 stories in the One America Plaza building. I beat my goal by over 90 seconds and crossed the finish line in 5:32 (Official Time!). March 2014: Scale the Strat 2014. 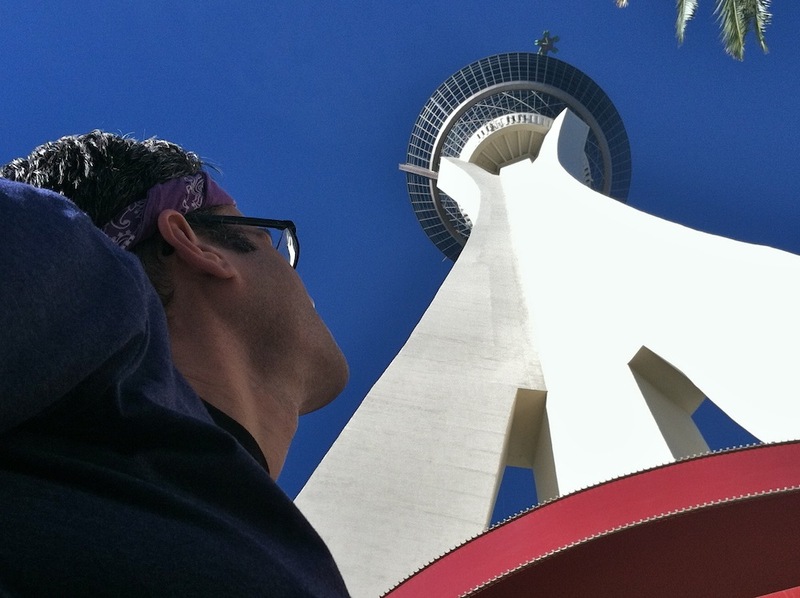 My first out-of-state stair race, up the Stratosphere tower in Las Vegas. There are 1,455 steps to the observation deck, and I climbed them in 15:06 (Official Time)! November 2013: CF Climb 2013. A race up the stairwell of the 54-story Figueroa at Wilshire building in Los Angeles. I set a personal record for my pace, and climbed the 1,245 steps in 12:10 (Official Time)! November 2013: Hike The Halo 2013. 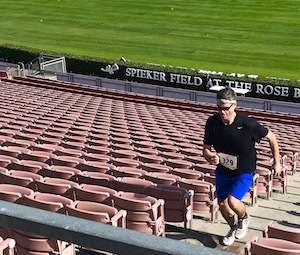 A race at Angel Stadium that combined stair climbing and running. The 2-mile course had 2,000+ steps. I finished 3rd in my division (!) with an official time of 30:20. 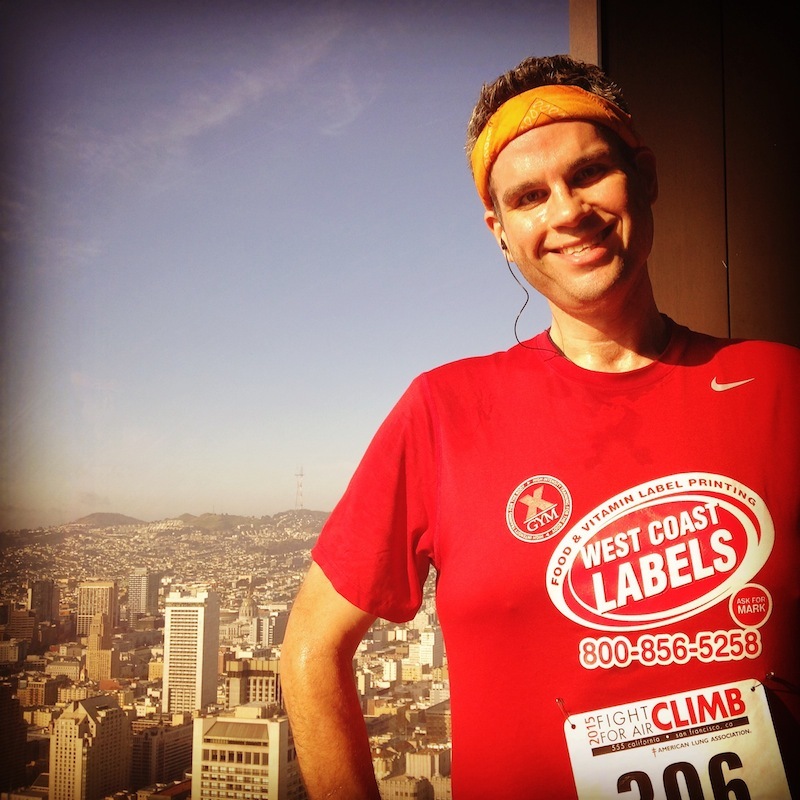 September 2013: Stair Climb for Los Angeles. A race up the US Bank Tower, the tallest building west of the Mississippi. I made it to the top of the 75-story, 1,664 step skyscraper in 20:29 (Official Time)! 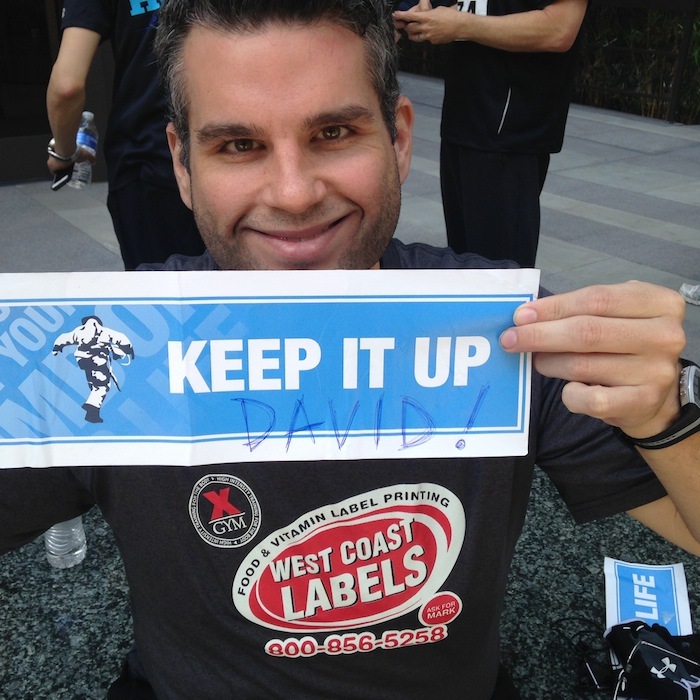 April 2013: Los Angeles Fight For Air Climb 2013. Despite a lack of training and a cold I was fighting, I still raced up the stairs to the top of the 63-story Aon Center in 17:21 (Official Time). November 2012: weSPARK’s 4th Annual 10K Run. The first event I’ve done twice. I was invited to officially start the race. Then that invitation was revoked (read about it here), but I did help pass out medals during the ceremony afterwards. zthe race itself, through the backlots at Universal Studios, was awesome. Official Time: 1:03:37. May 2012: BolderBOULDER Memorial Day 10K Race. My second 10K. I’ve never run so far in a high altitude before, but I ended up finishing only 2 seconds slower than my personal best! The finish line, inside the crowded football stadium at the University of Colorado, was pretty spectacular. Official Time: 59:08:46. 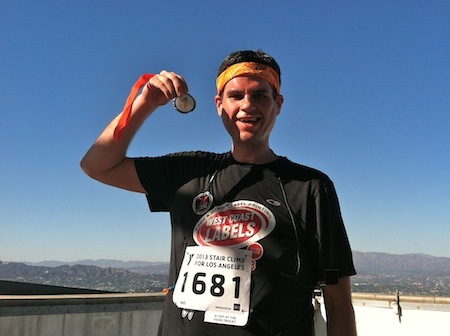 March 2012: Los Angeles Fight For Air Climb 2012. My first stair climb, up the stairwell, from sidewalk to roof, of the 63-story Aon Center skyscraper. Official Time: 15:24. November 2011: weSPARK’s 3rd Annual 10K Run. My first official 10K! 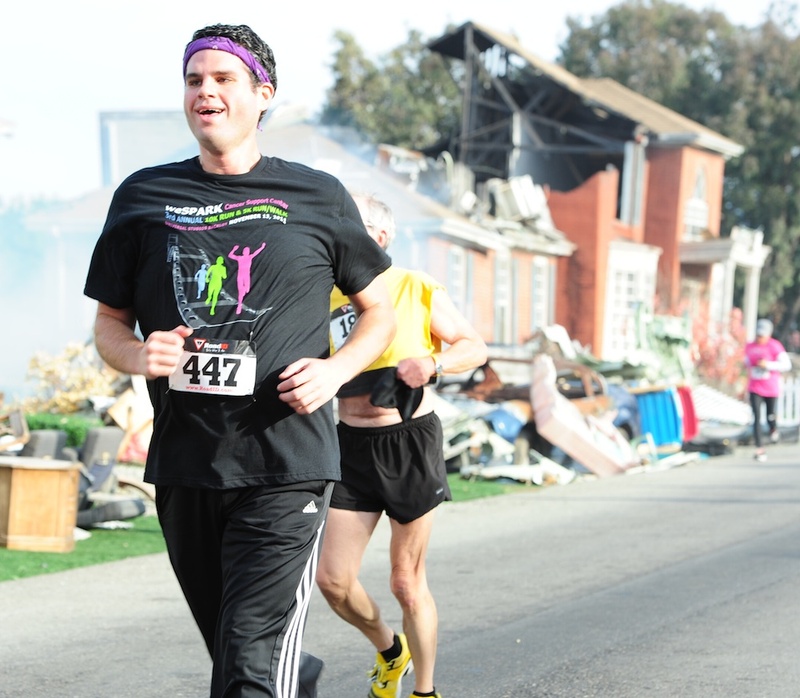 The course was through the backlots at Universal Studios in Hollywood. Read more statistics here and see official race photos here. Official Time: 59:06.5. I can’t wait to keep adding to this list!